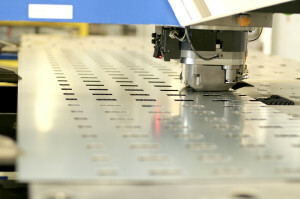 At Mid Plains Industries we realize not all items are efficiently cut using a waterjet or laser. Our shearing capacity of up to 1/4” by 10 feet long in mild steel and 3/16” by 10 feet long in stainless allows us to quickly cut sheet metal to size. With the added notching station complimenting our shearing process, Mid-Plains can effectively move your parts into the next stage of fabrication.